The library is named after J. Francis Cardinal Stafford, Apostolic Penitentiary at the Vatican and former Archbishop of Denver (1986-1996). 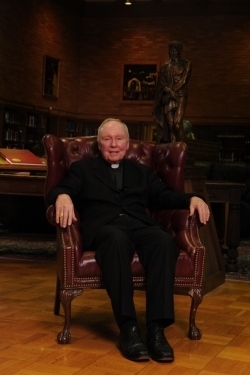 While archbishop, Cardinal Stafford was a dedicated user and promoter of the library and of Catholic education. He was the driving force behind the establishment of St. John Vianney Seminary on the grounds of the former St. Thomas Seminary. His Eminence, J. Francis Cardinal Stafford, for whom the Library is named. The Cardinal Stafford Library serves as a religious, intellectual, and cultural resource in Northern Colorado as it contributes to the educational excellence of St. John Vianney Seminary. Beyond the seminary community, the Library serves the needs of other educational programs in the Archdiocese of Denver, including the St Francis School for Deacons, the Biblical School, the Catechetical School, and the Augustine Institute. The library also extends its resources and services to the general public and enhances the cultural atmosphere of Northern Colorado by hosting a used book sale, book clubs, art exhibits, book signings and lectures. The Cardinal Stafford Library is open to the public. With more than 150,000 books, audios, and videos, and with subscriptions to the best scholarly journals in theology (300 print periodicals and thousands of online periodicals), the library is a center for research. From its founding in 1908, the library has compiled one of the finest collections in Catholic theology, church history, biblical studies, liturgy, canon law, religious art, philosophy, and literature. Special collections include over 500 rare books dating back to the early 16th century and many periodicals with full runs dating back to the 1800s. Children are welcome to explore the books and videos in our children’s area. The Archbishop Vehr Reading Room provides a spacious environment for study, with 2,000 reference works ready at hand, two copy machines, and computers with internet access and printers. All patrons are welcome to use the library’s electronic resources, including BibleWorks, indexes and full-text articles from thousands of journals, Library of Latin Texts, and Thesaurus Linguae Graecae. A reference librarian is available to assist in research. The Friends of the Library Room houses an ongoing used book sale, continually restocked with hundreds of books priced very reasonably. Rotating art exhibits may be viewed in the G. K. Chesterton Reading Room. Come and discover “Denver’s best kept secret”– the Cardinal Stafford Library.